I confess I stole this idea. Well... maybe not stole it; just recognized the truth of it. You see, I once attended an aikido workshop in Sacramento in the late 1980s taught by Hiroshi Ikeda, the last uchi deshi (apprentice) of Morihei Ueshiba, the founder of aikido. Ikeda sensei started the workshop out explaining how every household makes fried rice differently. (Fried rice is one of the solutions to the ubiquitous Far-East Asian problem of having lots of leftover cold rice.) He went on to talk about how, over the years, one learns various things from the many teachers and from the various experiences one has in life. If someone wants a presentation of what you know/practice, you throw pieces of your different life lessons into the hot, oiled pan (making sure that they harmonize with each other), stir them around, add fresh ground pepper (I put chopped garlic and ginger into the oil) and some soy sauce, and (voila!) 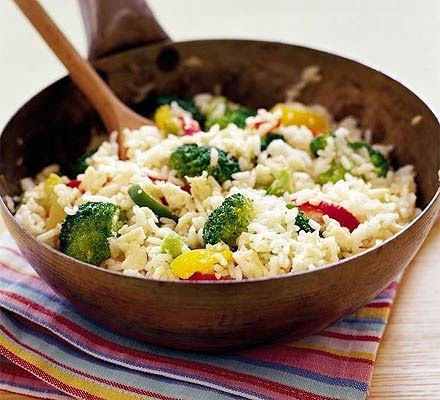 you have your version of fried rice. "So today, I humbly offer you MY fried rice," he said with a winning smile. Now, I have never been the type of student of martial arts or any other physical discipline to be satisfied with only practicing in the school. That's partly because I'm not a particularly graceful or coordinated individual. I have to put more effort into learning physical movements than other people. But mostly I practice at home on my own because I want to make things my own. It's one thing to do something in a classroom while many other people are trying to do it and the clock is ticking away. It is totally another to be by oneself, out under the open sky, or in your own home, and having the time and peace to concentrate on what you wish to teach yourself, to absorb it into your bones. It's also satisfying to go back to class and be able to move on from the last lesson, rather than spend time and effort trying to remember what you learned earlier, or didn't learn, as the case may be. So, for thirty years now, I have exercised every morning. And over time, the routine has constantly changed. The red thread running through every routine is that the exercises have to address breathing, balance, flexibility, and moving from the center. Depending on what my needs are in a given period of my life, I put together different routines that include elements of what I have learned from aikido (my primary discipline), tai chi, kigong, yoga, and systema (a Russian martial system). It is my fried rice. It includes the things I find at hand, combined with an eye toward harmony, with the ultimate aim of nourishing my body, mind and spirit. When I was younger, if the subject of my morning routine came up, I disliked telling people that I "excercise". It conjures images of somebody doing push-ups, jumping jacks and sit ups. It didn't matter so much what kind of an impression this made on other people as that it didn't make me feel good about it. Sometimes I tried to describe what I do and it would be too complicated, and people's eyes would glaze over with incomprehension or boredom. ...from Hindi yoga, from Sanskrit yoga-s, literally "union, yoking" (with the Supreme Spirit), from PIE root *yeug- "to join" (see jugular). I do these exercises to integrate myself internally, and with my highest ideals. They are my yoga. They are my fried rice. If you ever come to one of my Dream Warrior Training workshops, I'll serve you a helping. Fried rice is a great metaphor for your own stuff prepared from different 'ingredients'. I prefer to tell I do morning 'exercises' to avoid questions. But yoga is a great fit here too. All life is yoga after all.